During the brutal suppression of the rising (with atrocities amounting to genocide) Fr Pinot was captured while fully vested for Mass. He was dragged through the streets to the jeers of hostile spectators and soldiers and thrown into prison. After twelve days, he was sentenced to death for refusing to take the oath. 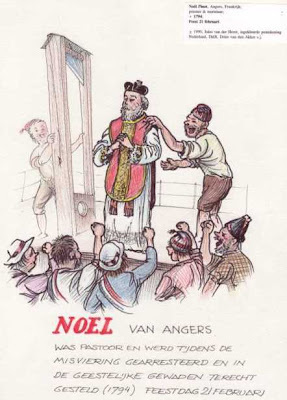 He went to the guillotine still vested for Mass and repeatedly praying the words that begin the Mass: "Introibo ad altare Dei, ad Deum qui laetificat iuventutem meam. Whenever we suffer, we should always remember that our trials are puny compared to those of the heroic martyrs of the faith.